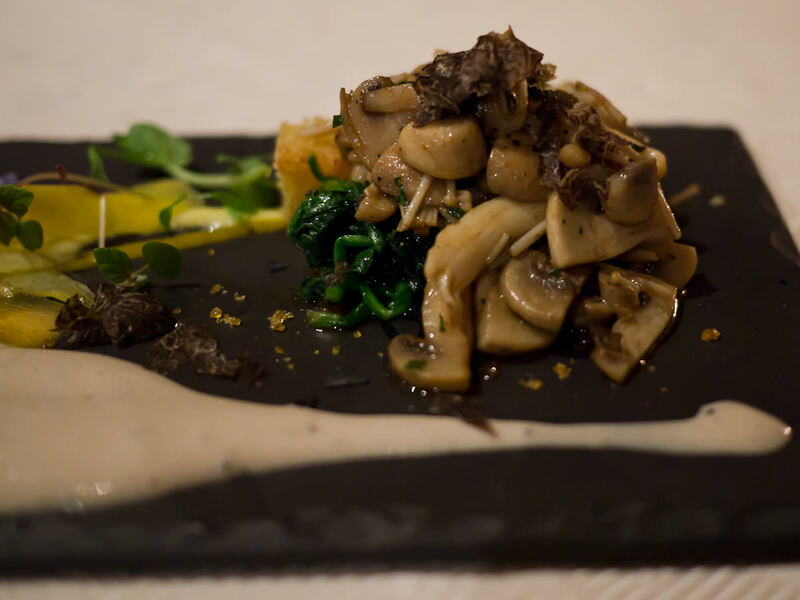 I wrote about the mushroom dishes I ate at Clarke’s of North Beach back in July as part of Mushroom Mania. Here’s the meal in its entirety. 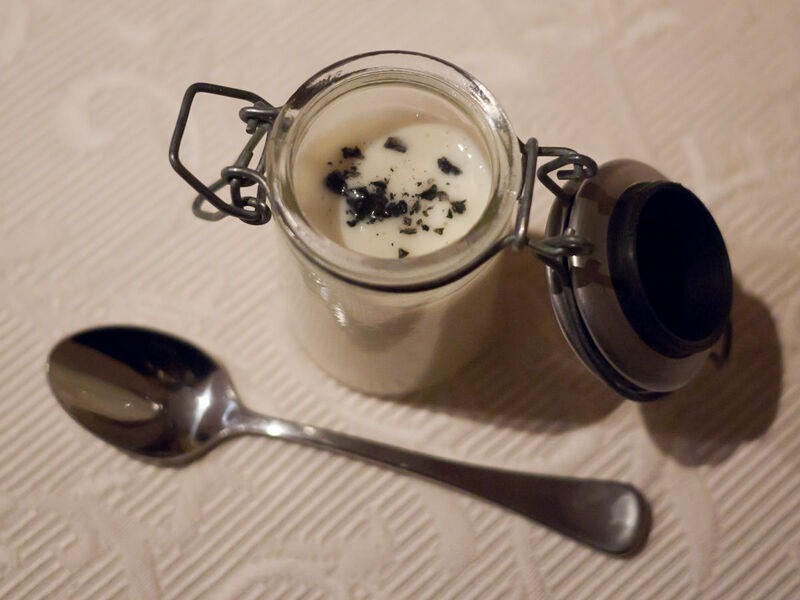 The evening’s amuse bouche was cream of cauliflower soup with truffle (AU$6), served in cute little jars with teaspoons to eat it with. We flipped the lids open to release a wonderfully enticing aroma from the specks of black truffle on top of hot snowy white soup. Jac called it “the savoury version of chocolate fudge on really good homemade vanilla ice cream”. Quirkiness aside, it was delicious. We could hear spoons clinking in jars all around us – the sound of fun and happiness! 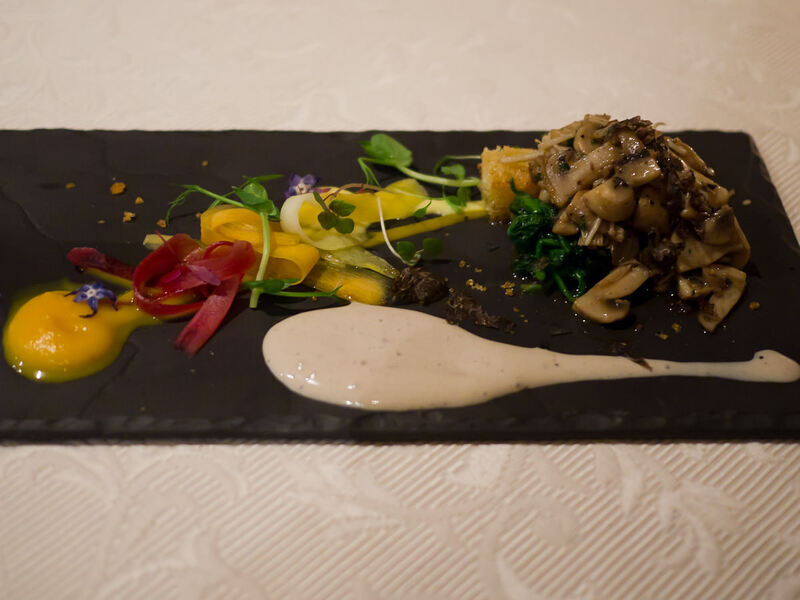 In my original post about Clarke’s of North Beach, I likened my mushroom dish to an artist’s paint-splattered palette. 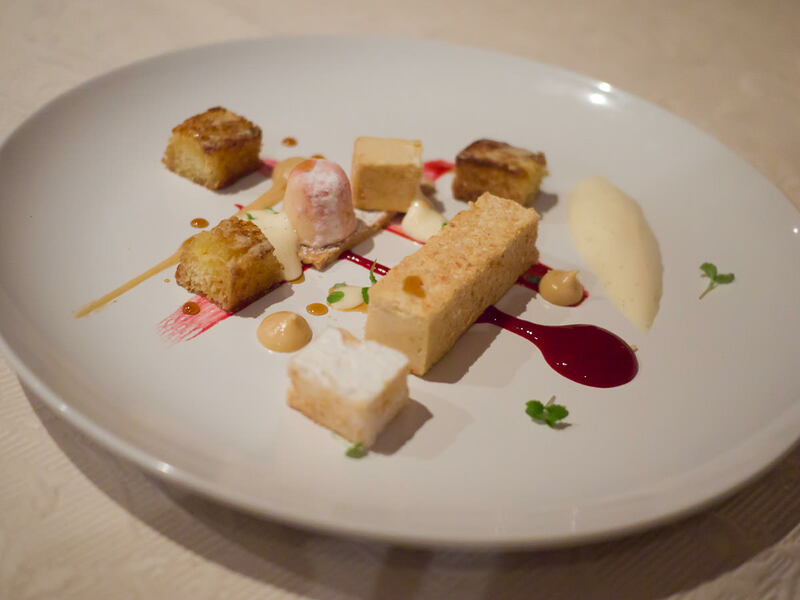 In fact, just about all our dishes could’ve been artists’ palettes or paintings. 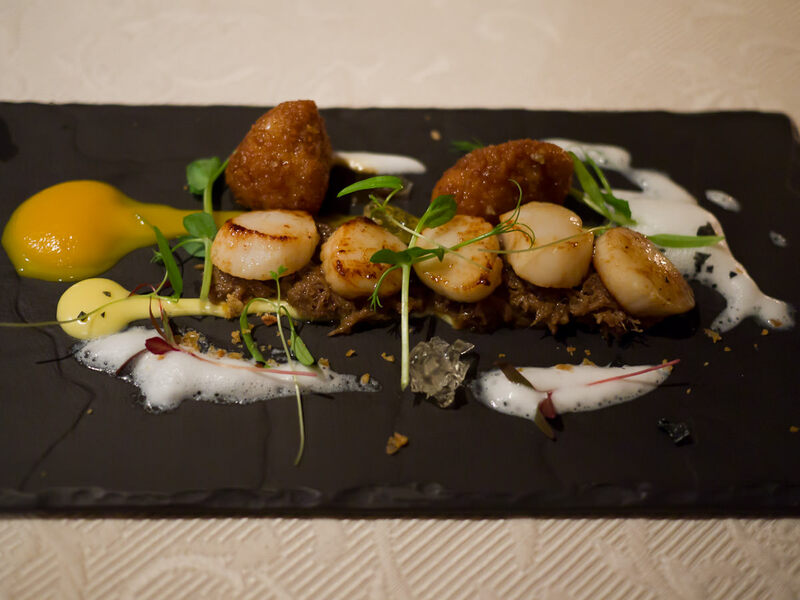 For her starter, Jac ordered the seared Carnarvon scallops, veal sweetbreads, braised pork cheeks, elderflower jelly (AU$22). This was a dish of different textures: sweetbreads crispy crumbed on the outside, tender on the inside; springy scallops; soft braised pork cheek; blink-and-you’ll-miss-it translucent elderflower jelly; fine pea shoot tendrils, mystery foam like cotton wisps. We’re not really fans of foam on dishes though. It seems many of you aren’t foam fans either, as my recent foam poll revealed – 71% don’t like foam, 22% are indifferent and 7% like it. Be warned – as we found out, Clarke’s of North Beach is foam country. For my starter, I ordered the toasted brioche, saute winter mushrooms, porcini caramel, warm chestnut espuma, Manjimup black truffle (AU$20). The winter mushrooms consisted of shiitake, oyster and impossibly tiny baby enoki mushrooms, all cooked perfectly and piled on juicy green spinach. Like Jac’s dish, it was an interesting collection of tastes and textures, with crisp vegetable ribbons, freshly shaved savoury black truffle, vividly yellow sweet pumpkin puree, creamy chestnut espuma, dainty little purple flowers and crunchy fine golden crumbs scattered about, and the indulgently buttery brioche. Jac wasn’t so keen on the blobs, splashes and dribbles on the plate and said so – she thought it was messy, I thought it was visually appealing and interesting. But most importantly, it tasted good. 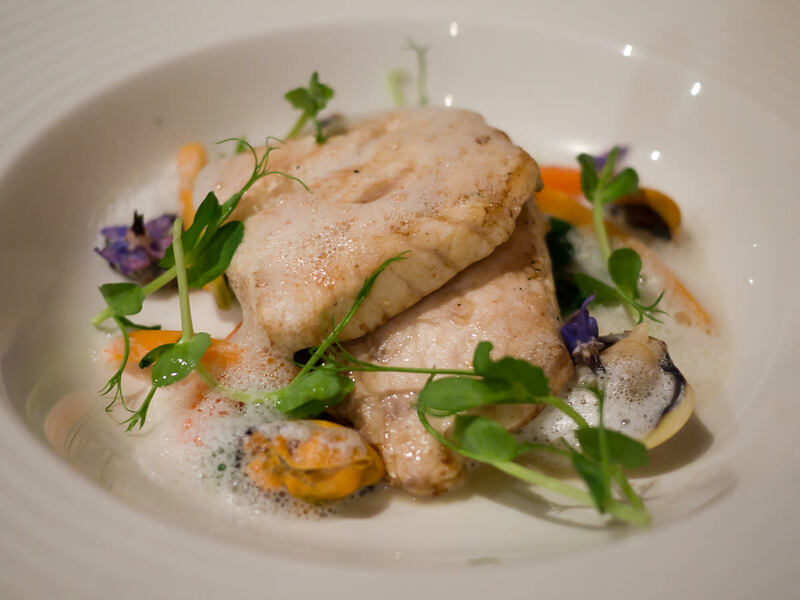 Jac’s main course was line-caught Pigeon Island pink snapper, mussels, clams with a saffron emulsion (AU$44). The fish was meaty and cooked well. Sadly, the mussels and clams were overcooked, tough and rubbery. Jac felt that the shellfish weren’t really needed in the dish and because they were overcooked, spoiled the dish – the fish would’ve been beautiful and substantial on its own. She also craved a sauce instead of the foam, which didn’t provide enough moisture for the two large pieces of fish. 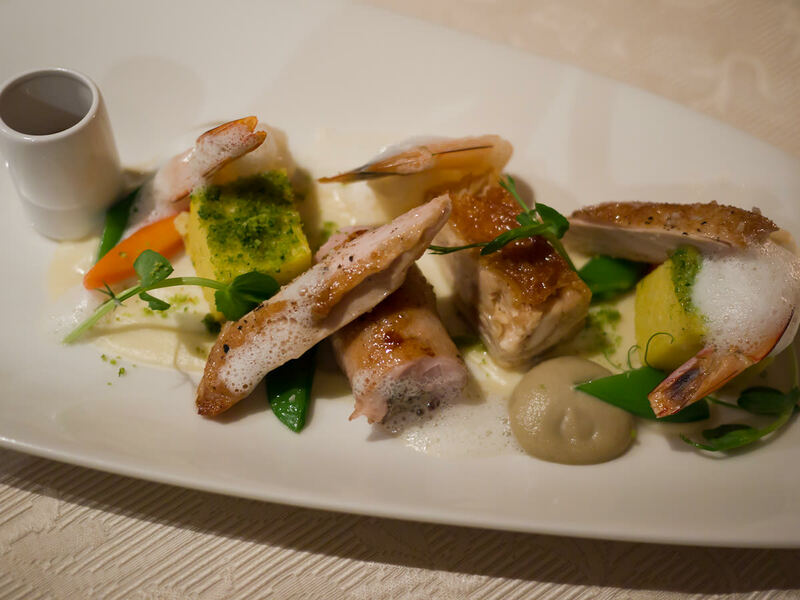 I ordered the roasted free range poussin, king prawns, polenta, speck, garden peas (AU$42). In the cylindrical container was a rich chicken jus. The poussin was moist and tender with salty crispy skin that I immediately wanted more of. The prawns were proud specimens, nicely cooked, but were party crashers that brought a taste of the sea that didn’t seem to belong on a plate with roast chicken, chicken jus and garden peas. 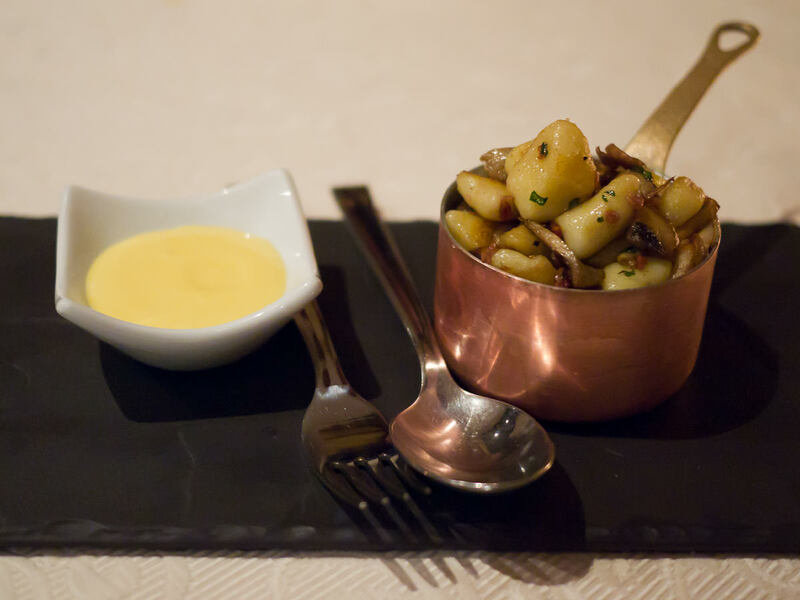 We shared a side of saute royal blue potato and mushroom gnocchi with pancetta (AU$14), served in a little burnished copper pan, with a dish of hollandaise sauce. The gnocchi were perfectly soft, delicate little pillows, browned ever so lightly, with mushrooms and salty little morsels of pancetta. The gnocchi was delicious on its own and we didn’t really need the hollandaise to go with it – though Jac was grateful for the extra sauce and ate it with her fish. For dessert, I chose the marquise au chocolat, coffee macaroon (sic), pistachio ice cream, chocolate gremeux, passionfruit (AU$15). I’ve mentioned previously my dislike for basalt slabs used in restaurant plating. As I tried in vain to scrape the chocolate powder off the plate, I only succeeded in getting it all over the tablecloth, my shirt narrowly escaping a messy fate. You really don’t want to know what the tablecloth looked like by the time I was done – a bit of a brown horror! This was one of the most visually interesting desserts I’ve had in a while. It looked like rocks and soil, like a tractor-driven muddy field, like logs floating down a brown river, it looked like… bracelets. 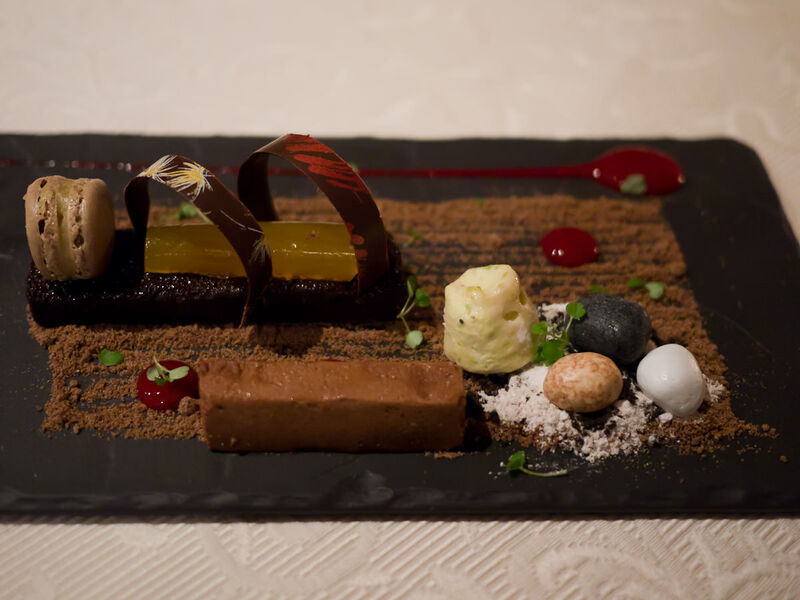 It was chocolate in different textures – dust, thin sheets, mousse, and disguised as rocks. Jac chose the peanut butter and caramel parfait, liquid puff pastry, maple French toast, salted caramel (AU$15). I like intricate plating much more than Jac does. It’s a personal preference, and I’m sure many of you will agree with Jac and prefer your food to be simpler, less fiddly and not so arty-farty. Certainly, on thing we both agreed on: too much foam! The soup was a highlight but as the meal progressed I think the complex style of presentation and the need to “discover” what was on each plate grew increasingly tiresome to Jac. I really enjoy that style of eating as long as the food itself is not difficult to eat and is tasty – for me, deliciousness always overrides the fun, intrigue and presentation of any dish, especially when it’s not cheap. There is a fine line between interesting plating and getting carried away and putting too much on the plate – and I think it’s a subjective fine line. Service was very good. 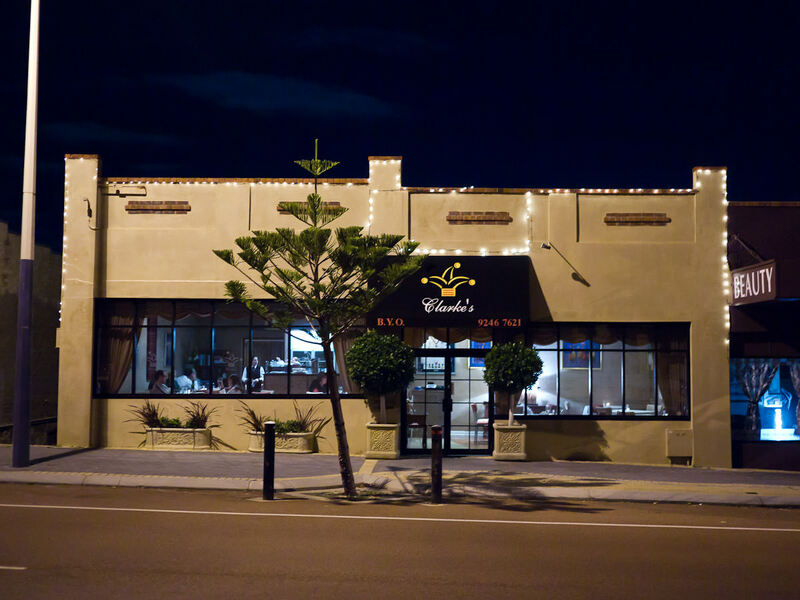 The staff were attentive and friendly but not obtrusive. Our water glasses were refilled without us needing to ask, and our plates were cleared promptly with smiles. This was a dining experience we didn’t agree on; I’d return to Clarke’s of North Beach but Jac probably wouldn’t. Her chewy rubbery shellfish would’ve also played a part in this conclusion – if you are served overcooked seafood in a restaurant, I reckon you always remember that and as a consequence will be unlikely to return – what do you think? Have you and your partner been to a restaurant that one of you really liked and the other didn’t? We ate a delicious dish of Linley Valley pork belly with truffle, crackle dust and apple sauce created by Stephen Clarke, head chef of Clarke’s of North Beach, at the Mundaring Truffle Festival 2011. THAT dish got the thumbs up from both of us.